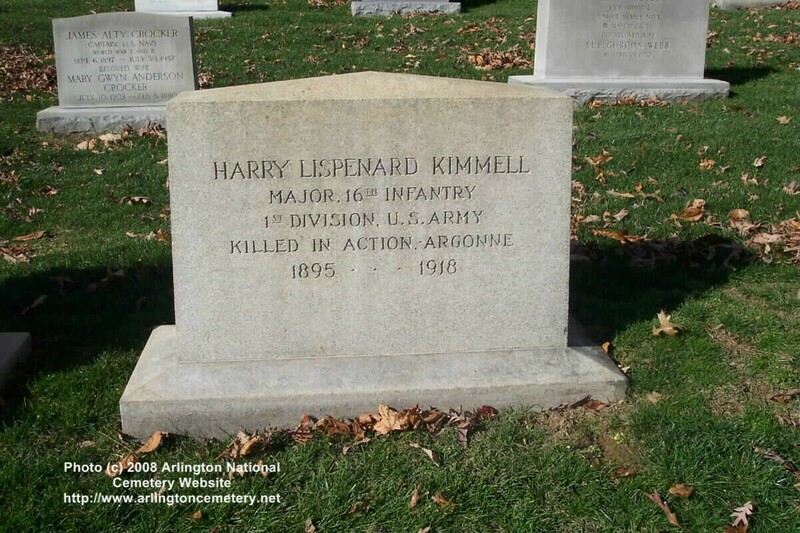 Harry Lispenard Kimmell: b. 10-13-1895 in Washington, D.C. The Distinguished Service Cross is presented to Harry L. Kimmell, Captain, U.S. Army, for extraordinary heroism in action south of Soissons, France, July 19, 1918. When his company was halted by machine-gun fire from the front, Captain Kimmell led a platoon through heavy machine-gun fire and captured the enemy position, forcing its defenders to surrender. His gallantry enabled the entire battalion to continue the advance. The Distinguished Service Cross is presented to Harry L. Kimmell, Captain, U.S. Army, for extraordinary heroism in action north of Fleville, France, October 9, 1918. Captain Kimmell personally led two platoons of his company against a strongly held enemy position. He fell mortally wounded while leading this advance, but other members of his command, inspired by his gallantry, successfully assaulted the enemy position.